The first page of Sharon Creech’s Love that Dog cuts to the heart of this post in many ways. 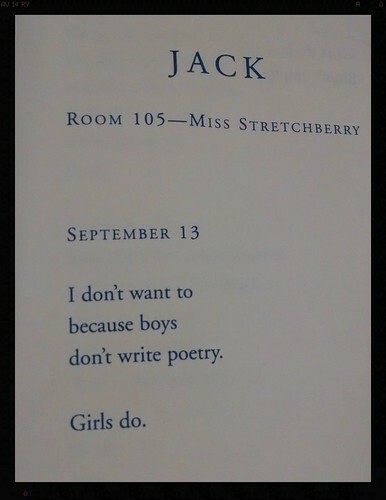 Jack, a young student, is doing a poetry assignment in class, and he writes: ... boys don’t write poetry. Girls Do. As Jack learns over the course of exploring something traumatic, writing can become the key to unlock his understanding and writing can help him come to grips with the world, at large, in all of its unfairness and potential. Creech’s free verse novel is an important read on so many levels, including puncturing the perceptions that boys don’t write poetry, or about feelings. 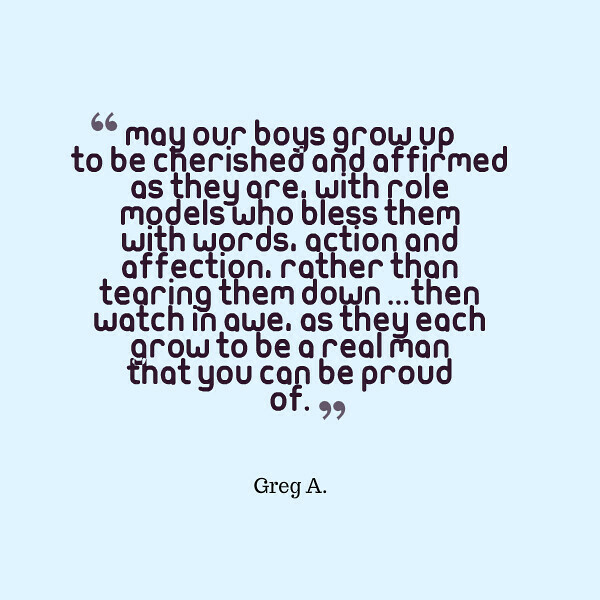 Greg A. — over at his blog, Dash: Life Between the Numbers — wrote a very powerful post for Slice of Life the other day that has stuck with me for days and had me writing this post as a sort of response. I wrote a comment for him, suggesting in a half-joking way that a social media campaign about what “real men” were in the world of writing and sharing might be appropriate. That’s the image below here — my meme attempt to celebrate men as writers. Of course, there are plenty of male writers in the world, but there are still many boys in my classroom who fall into the gender trap of males as athletes, not as poets; of men as leaders, not as collaborators; and on and on. We teachers often dispel those myths as soon as they pop up (I hope), as learning moments, although sometimes (too often? ), you can feel the invisible pull of the views from home informing and constructing our young people’s views of the world. I am very sensitive to this situation, and never openly disparage conflicting points of view, particularly if influenced by parents. Instead, I seek to provide alternative views of the world, where balance and equity prevail. We talk. We write. We try to understand. So, I write with them. I share with them. I am careful not to share too much, of course, but I am deliberate in showing how my writing expresses myself, and how young writers of any gender can accomplish great things. I show I care. Yet, even in my own writing life, I see this gender split. I can’t help but notice that our Slice of Life community, which Greg and I are part of, is mostly composed of women. I am being careful here, because I am not putting blame on anyone for this disparity. They are wonderful women in the Slice of Life world. I am just noticing, as I have in other years, that the disparity is there. 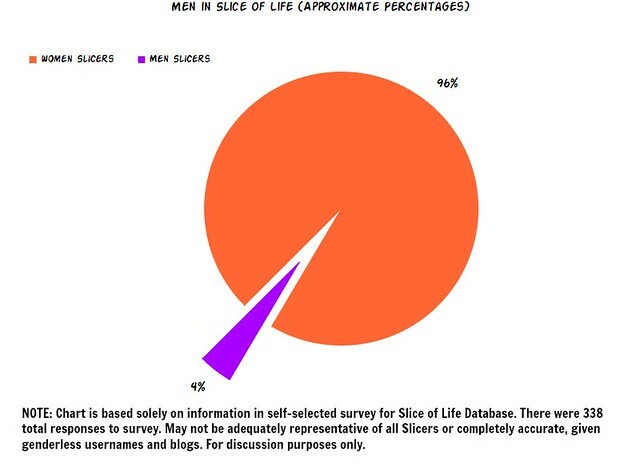 The gender balance in Slice of Life is out of balance, although that has always been very anecdotal. This year, however, we were given access to a database of Slicers, as a way to create “writing pods” (great idea, although I am wary of making “male writer” pods as a solution to this post for fear of further isolation, right? And Two Writing Teacher folks are not suggesting we gather by gender, anyway). I wondered if I could discern gender by looking at the more than 300 people in the database who signed up as Slicers looking for Writing Pods. Mostly, I could indeed get a sense after some analysis, although my data chart should not be considered scientifically accurate (some usernames and blogs had no discernible gender, and others are blogging without filling out the form, and so on). But, I think this chart, and its wide gender disparity, does capture my sense of the Slice of Life community. Maybe it captures the teaching profession itself. (And a whole other range of questions around race would no doubt fill many more blog posts). Men are reluctant to share personal details and emotional insights in a public space for fear, as Greg notes, of the Man Card gender issues. And now I have to say this again and be clear: I have only ever felt nothing but supported and invited in the Slice of Life and Two Writing Teachers‘ communities, and there has never been a single practice of exclusionary invitation to anything I have seen. Ever. Not once. So why aren’t more men writing in the Slice of Life? Why aren’t they taking part in rich discussions about writing and teaching and connections? I don’t know. They should. You should. Consider yourself invited to the Slice of Life, a daily writing activity through March and then every Tuesday throughout the year. Find your small moments. Write your experiences. 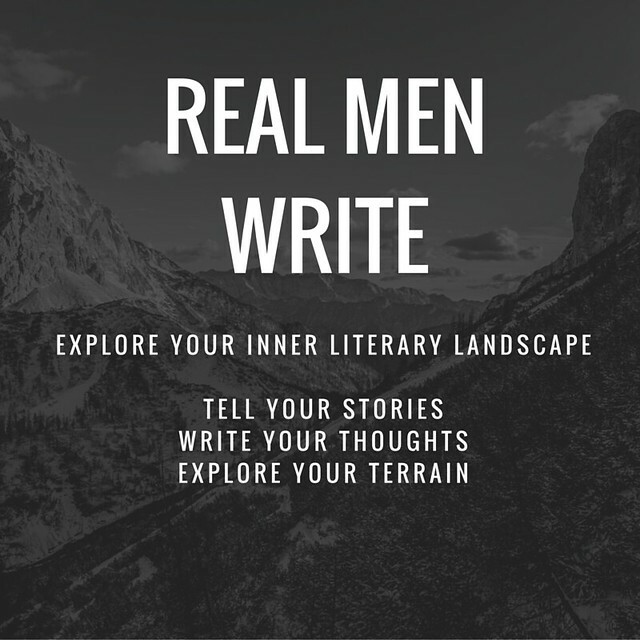 Real men write. They really do. 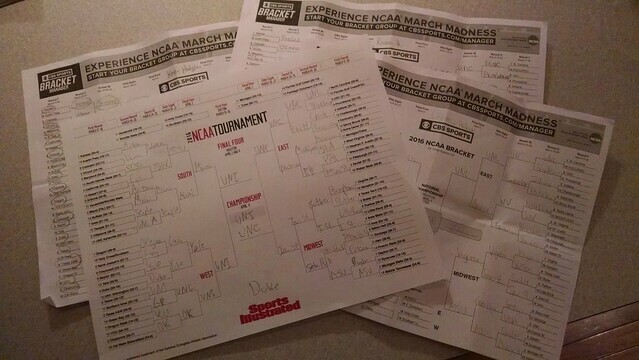 You know it’s March in our house when NCAA brackets start showing up everywhere. On the counters. On the floor. In the mudroom. By the shoes. Under beds. On desks. In backpacks. Every day that our newspaper comes out, with a blank NCAA bracket as part of an advertising campaign (we sent in our picks to win some gift cards), one of the kids grabs it and starts filling it in. We, of course, have our “real” brackets, too, but they like doing other ones. I think the youngest is just intrigued by the nature of bracket eliminations and match-ups, and the visual playfulness of bracketology. And as I have written about in other years, our dog, Duke, has his own NCAA bracket in the house, determined over a long activity with the process of which of the two hands he sniffs with his nose (they both contain kibble) for each match-up. I know you want to know: Duke has the University of Northern Iowa winning the whole shebang! Now, that would be a tournament upset worthy of a dog biscuit or two. (Ironically, he has never chosen Duke to win it all). 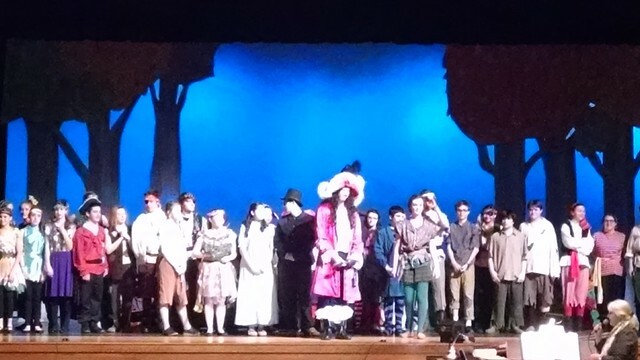 It seems like each year in March, we get a chance to see a preview of a musical production by our regional high school. Some years, they come to our school. Most years, we go to them. Yesterday, we went to the high school and watched with wonder as these talented high school students put on a preview of Peter Pan. About two-thirds of the theater group are former students, so part of the game for us teachers is trying to remember names and faces, and look beyond costumes to remember their time in sixth grade. It’s not easy, and we laugh about it at lunch later on, but we sit there in our seats, so proud of them anyway. We remember Captain Hook as the kid with incredible musical talent, even early on, and Peter Pan as the girl with a dreamy look in her eye. We see the “lost boys” and shake our heads. We watch the dance routines and remember Talent Show nights. The Peter Pan production was lavish, even though we could not witness the “flying” that will happen in the three days of the run of the musical play this weekend. Apparently, that involves some intricate systems and contraptions and lots of adult supervision that was not available for us. At the end, they left time for questions from the audience of younger students, and the range of questions — from auditioning for parts (everyone who auditions gets a part) to rehearsing (since January) to the backstage coordination — showed a high interest from the audience. Again, I was reminded of how important the Arts are for so many students, and how dreadful it is when the Arts get cut or curtailed due to funding or the push into standardized testing. This is a different kind of Slice. I wanted to step back from a photo that I took in the woods and analyze the shot from an analytical viewpoint. I am no photographer (but I play one on my blog). However, I am interested in composition, and composing with images is always an intriguing topic. With so many camera lens available these days to so many of us on phones and mobile devices, we can do some interesting photography. I had my Android phone out because I was keeping track of a college basketball game (UConn!) as I was keeping an eye on the kids and watching the dog watching me. I was stopped at a new fence over a rebuilt foot bridge on the bike path when I looked down and saw these ant-like bugs scurrying over the handrail. They’d stop, run, stop, run, stop, run. Sometimes, they would run at each other and stop right before collision, like some strange teenagers on bicycles playing Chicken. I wondered if I could get close enough to get a good shot of the bugs but the closer I got, the further they scurried. Finally, after many random shots that I hoped might yield something useful, I got a picture that did the trick: two bugs, mostly in focus, on the wood, seeming to meet. Actually, the closer bug is a little out of focus but it works as a compositional strategy. Our eyes move from that bug to the farther one, which has more detail. The problem was that the bugs were too small on the shot itself, and the wood handrail took up most of the frame. I went into my photo folder, called up the shot and used “edit” to tinker. I cropped the shot down to focus the eye on the bugs (and the shadows of the bugs, which is something I did not notice when I was taking the shot). I decided something more was needed, to keep the eye moving towards the two bugs, and the focused bug, in particular. I used a framing tool that provided some darkening edge — a light touch, not too obvious — that helps guide the eye inward, at the bugs. It also helped crop out more of the surroundings. 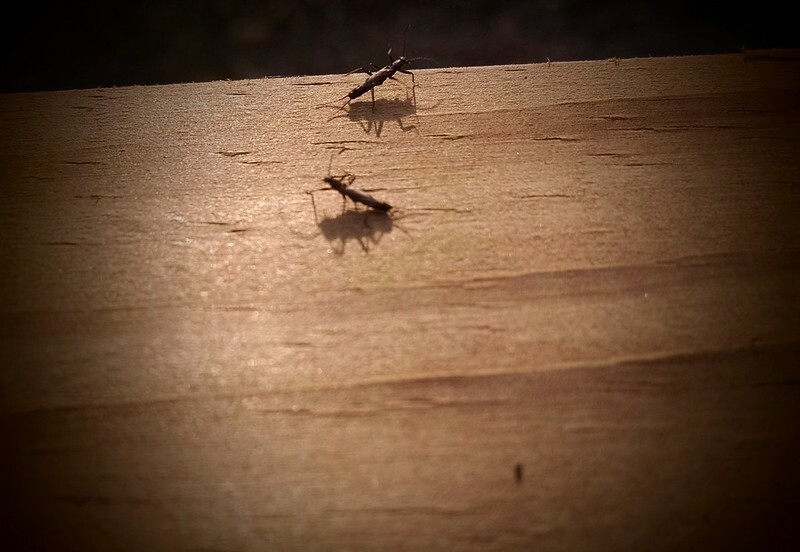 There’s something about the grain of the wood (you can tell is it rather fresh and not yet weathered by New England’s shifting seasons) and the bugs meeting, and the shadows, that just makes this a rather intriguing picture. Or, at least, I think so. The First Second Publishing company, one of my favorite sources for interesting graphic novels, has started up a new educational graphic novel series around science. 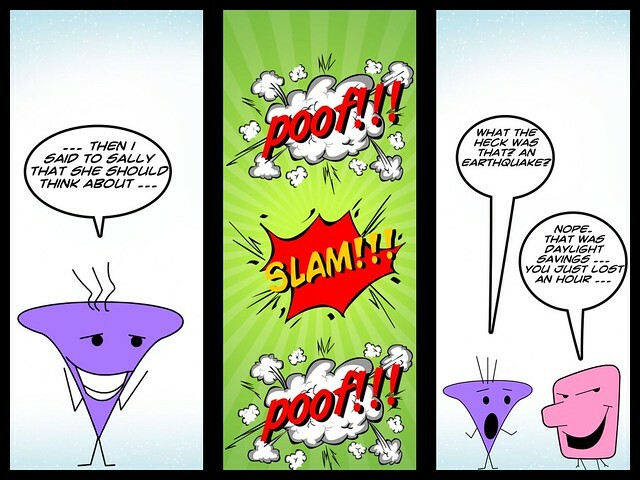 Called Science Comics, the books are designed to help readers dive deep into scientific ideas. 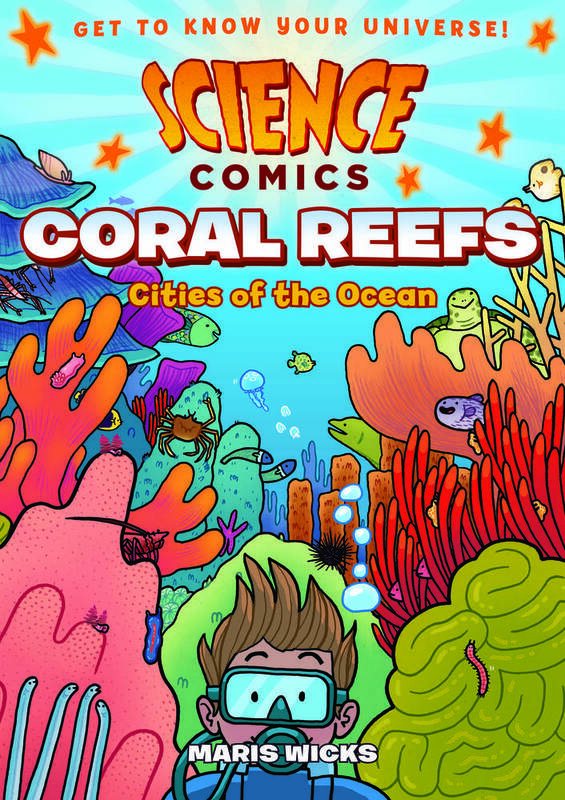 I just finished reading one of the first in the series, called Coral Reefs: Cities of the Ocean, and it is a fantastic example of how graphic novels can impart important information in a fun and engaging way, with humor mixed in with facts in a very visual way. Author/illustrator Maris Wicks works as a program manager at the New England Aquarium, so she is well versed in all things related to the oceans. The book introduces us to our narrator, a little Bony Fish (known scientifically as Osteichthyes .. lots of content-area vocabulary in here), with big glasses, whose witty and funny and curious about the world. The reader, entertained by the narrator, comes to learn about such concepts as classification of animals (Kingdom, Phylum, Class, Order, Family, Genus, Species), the impact of pollution and global warming on the seas, and a wide array of creatures who live in the ocean. But, as the title suggests, we also learn a whole lot about Coral Reefs, which are amazing structures that have a vital importance to the world as home to many fish and plants, and other smaller beings who helped filter our air and water for the rest of us, even though we rarely show our appreciation. We learn about Coral as a living creature, and how Coral Reefs are formed, and the symbiotic nature of Coral and other creatures. We also learn about the fragile nature of Coral Reefs in the era of Global Warming. It’s not all gloom and doom, as Bony Fish gives us suggestions for what we can do to protect our oceans, even if you live nowhere near it. The artwork here is very engaging, and integrates complex information in ways that should hold the interest of any reader interested in the ocean and Coral Reefs. Unlike some content-area graphic novels out there in the world (and I have read more than my share) that seem thrown together to make a buck off the graphic novel movement, Coral Reefs: Cities of the Ocean seems more like an act of love by someone who is deeply immersed in the ocean, as Wicks is. A likely target audience would be upper elementary into middle school, although younger readers would still get a lot out of the book, even if some of the vocabulary was too dense. My wife and I attended the annual Bulb Show at Smith College, in our small city, yesterday afternoon. 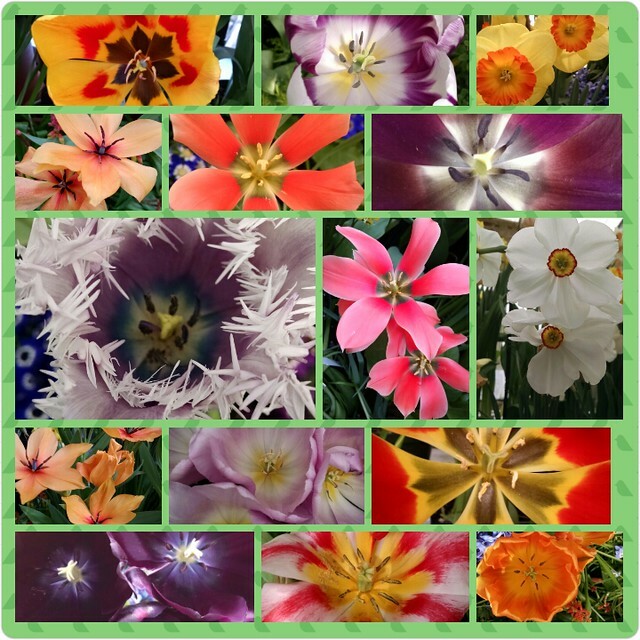 It’s been a few years since we have ventured into the greenhouse and been awed by the powerful display of colors, smells and pure life on display. It’s a pretty amazing experience, to be walking down aisles of amazing flowers, and I was drawn to look inside the flowers themselves. So I pointed my camera down into the heart of the flower as much as I could, and created this collage. 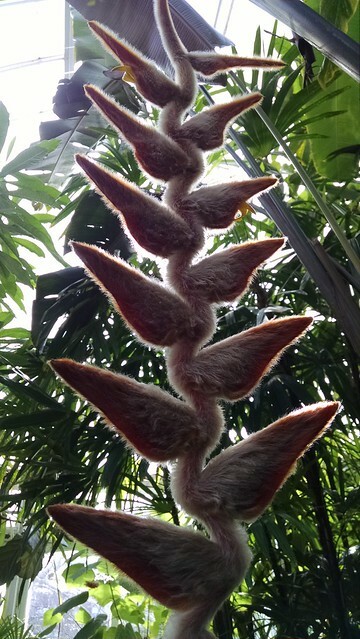 In another part of the greenhouse complex, there is a room of tropical plants, and this tree was dropping this seed pod, which looked like the furry tail of some strange creature. I could not resist a shot of it, and the way the sun filtered in the back of the photo gives it an interesting glow. 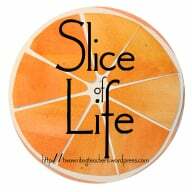 Slice of Life: Who Stole My Hour? Not much more to say here … my hour went missing last night and now I am wondering where it went … the only good news about Daylight Savings is that Spring has to be right around the corner, right? You ever have one of those strange moments when you hear a voice on the radio and you think: I know that voice but you can’t for the life of you remember why or who? That happened to me yesterday on my drive into school. I was listening to New England Public Radio and this commentator came on, talking about dogs and cats and spit and love. I know .. interesting, right? But as I listened to the piece and wondered about the dog/cat debate (I used to be cat; now I am dog), I couldn’t shake the feeling that I knew that voice — that timbre and tone and rhythm. Who was it? Come on, memory banks. It’s not that early in the morning! You’ve had your coffee! I never got to the answer on my own, but thankfully, the radio helped me out. The commentator was Robert Chipkin. Not many of you know him (and if you do, it would be really weird but it would also very cool), but he was an important person in my “life before teaching.” Before getting into education, I was a journalist for a decade with the larger daily newspaper in Western Massachusetts, and “Chip” was my first city editor there. Chip helped shape my stories and talked to me about the finer points of newspaper writing. He wasn’t a mentor, per se, but a decent editor who taught me some of the ropes of being a journalist and the politics of the newsroom. I was not a star by any stretch. Not rising nor falling. Just an average reporter, in it more for the chance to write every day than the glory of breaking some huge story. Hearing Chip’s voice in my car, and connecting his voice to his face in my memory … that sent me on one of those time tumbles, where you are taken back to your past. There I was, at my desk in the newsroom, wondering what the heck I was going to write on deadline, knowing my editors would be needing something any minute now. PS — Chip left the newspaper before I did and yet he writes a humorous column from the narrative voice of his dog at the newspaper. Talk about strange twists. One of the more significant “shifts” in any version of Common Core-aligned curriculum in the upper grades (and maybe even some lower grades) is having students reach across varied texts and then synthesize what they have read in a piece of developed writing. I am trying to do more of that with my sixth graders, but still find the coordination of texts, graphic organizers and thoughtful writing components is a lot to ask of many of my students. We did some work with this ‘reading across texts’ yesterday in class. It was one of those “teacher-led, think-aloud” days, where we worked together with the reading (the passages were about zoos and animals, so there was high interest by many), the annotated highlighting of passages, the breaking apart of the inquiry question (compare/contrast), building on graphic organization strategies from the whole year to adjust to more than one text, citing evidence from the three passages in a single piece of writing, and then talking through the writing piece. It was fruitful but exhausting, in many ways, and some students still had that ‘deer in the headlights’ look in their eyes. We’ll be doing this more than a few times this year, of course, and normally I go deeper into multiple texts and synthesis writing later in spring as we move more into argumentative writing. But our state is moving some of the PARCC style components into our state test this month, and waiting for my curriculum map to catch up to us would be an injustice to students who likely will be confronted with these multiple-text questions (we saw some last year, too, but this year, the state has told us there will be PARCC components). I’m not saying being able to read and comprehend, and write about, varied text is not a good skill to have. It is. I just know I, as teacher, need to keep learning more varied and better ways to teach it because even after what I think was some pretty decent teaching (if I do say so myself), I know it was not enough. And I have been thinking and working with this for quite some time now. I even led some PD with my colleagues a few years back. One of the best things about Slice of Life (there are many, of course) is that writing about moments every single day focuses your attention on things otherwise forgotten or ignored. You are always on the look-out for something you missed. I was walking down the school hallway yesterday morning, taking a break from an early morning of filling out report cards, when I saw a face that I see every day, and think: I should take a picture of that. So, I did, knowing that I would be writing about it this morning. 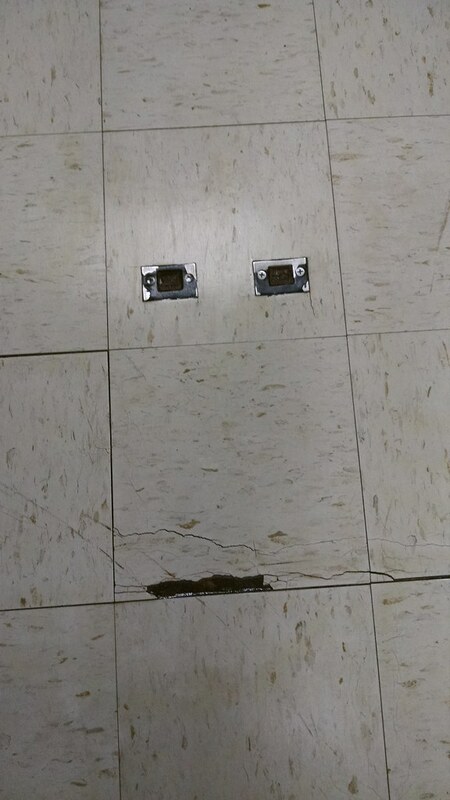 This Face on the fFloor, shaped by the construction of the floor tiles — and a chip in the tiles that has expanded into a sort of mouth — and the emergency door system, is just a wonderful surprise, and sometimes, I try to imagine what it is thinking all day long. (Heck, that just might be a Daily Create suggestion in the future). The Face seems contemplative about the world around it, doesn’t it? Almost … amused. We all see the world in different ways and I never asked students, How many of you have noticed the Face in the Floor? They pass over it and by it a dozen times a day. They are more likely to be chatting with friends, or thinking of lunch, or juggling books and binders, or looking at the artwork on the walls.